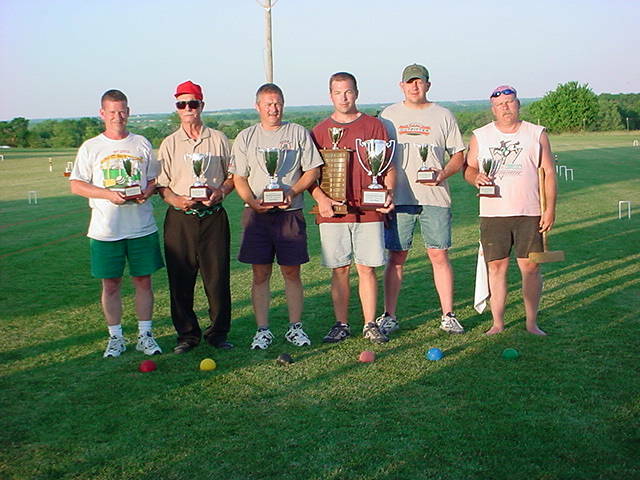 L to R: Greg Adams (Parkville Mo), 5th; Johnny Nichol (Warrensburg Mo), 3rd; Billy Bob Breeden (Gallatin Mo), 2nd; Matt Smith (Warrensburg Mo), 1st; Mike McNeely (Gallatin Mo), 4th; Troy White (Rockville Mo), 6th. Billy Bob and Debbie Breeden hosted the second annual Rockin’ B Croquet Association tournament the weekend of June 16–17. They have a fabulous four-court croquet complex that is the envy of local croquet players. Thirty-three participants put their skills to the test in front of a well-attended crowd of spectators. With a come from behind win, Matt Smith, of Warrensburg, Missouri, won the first-place trophy. Second place went to to host Billy Bob Breeden, third to Johnny Nichol, fourth to Mike McNeely, fifth to Greg Adams and sixth to Troy White. Participants came from as far away as Tulsa, Oklahoma, and Lake Perry, Kansas. 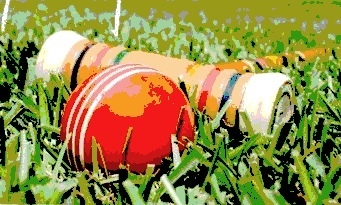 The Rockin’ B Croquet Association has fifteen members and practices are held usually on Sunday afternoons. If you are in the area and interested in joining or practicing, please check out the Association’s website or contact the Breedens.